Again am back with a super yummy treat to serve for ifthar. We all know that we should stay hydrated and drink plenty of water during non fasting hours. Especially when ramadan falls in summer, we have to drink more fruit juices and water to avoid dehydration. Yes, am with a energy boosting drink recipe today. A tasty healthy crunchy milkshake recipe. This drink recipe or milkshake recipe can satisfy both your hunger and thirst. Especially those who are in diet, this milkshake recipe is the best way to fill you up partially. That means you can have everything in one glass. Here sugar is substituted with dates puree which is best during ramadan. Some kids dislikes to eat dates as its own. This is one of the best ways to add dates in kids meal or desserts. Moreover this is a sugar free milkshake recipe and so is a healthy treat for kids and adults equally. 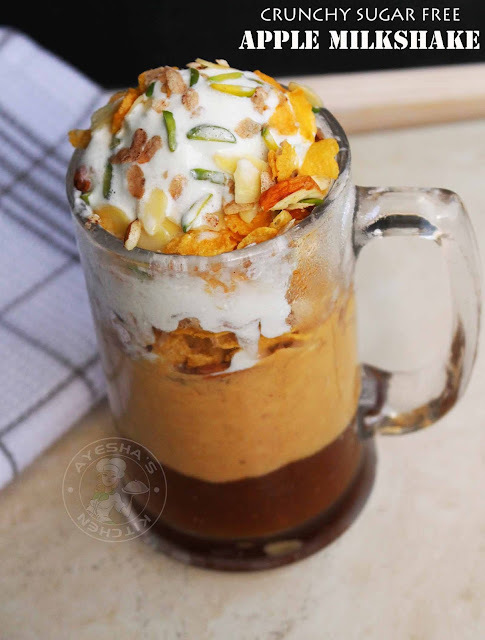 The roasted almonds and rice flakes adds a special taste and crunchiness to this milkshake recipe. 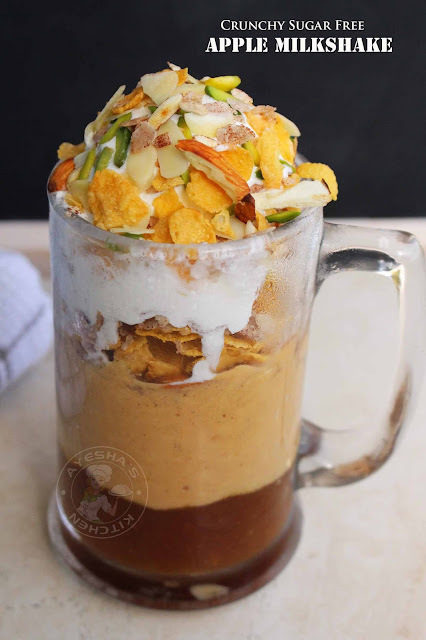 Cornflakes are always kids favorite and so kids will surely enjoy this yummy treat. Soak the dates in water for 15 minutes and then press with your hands tightly. Strain it user a strainer and set aside in a bowl. Pour 2 teaspoons of this dates puree in each serving cups (4 cups approximately ) and chill it until you make apple milkshake. Heat a pan and dry roast rice flakes (aval) along with sliced almonds. When the rice flakes turn crisp, transfer it to a plate along with cornflakes, pistachios, almonds. Set aside. Pour this prepared milkshake over the chilled dates puree. 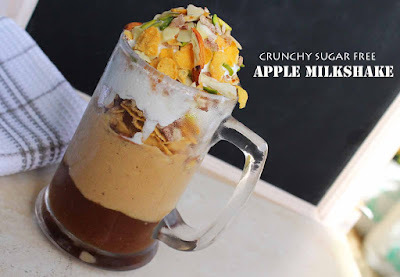 That is...pour 3 tbsp of this apple milkshake in each cups, followed by some cornflakes, rice flakes, nuts and then scoop ice cream over it ( i used low fat ice cream instead) and finally sprinkle some nuts, cornflakes, rice flakes etc. Serve immediately. Yummy, crunchy and healthy.